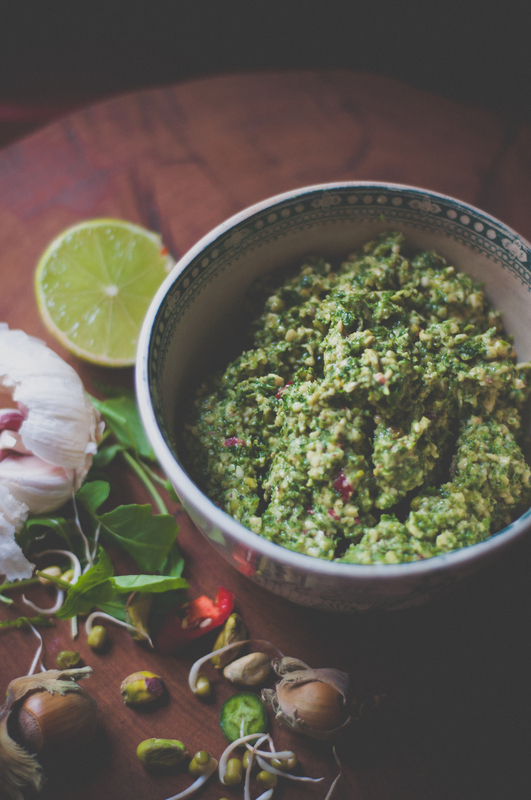 Mung bean pesto, are you mad? Well, perhaps a bit but this makes sense. This morning I took a lovely joint of Welsh salt marsh lamb out of the freezer for dinner later then headed to my cupboard. I’ve been cultivating a few jars of sprouting mung beans for about 4 days now, and as I was giving them all a bit of a drink this morning I had a nibble. As I munched away I looked at my joint of lamb and a thought occurred to me: the mung beans tasted very similar to the fresh cobnuts that I’ve neen nibbling on for the last week. I’d basically nibbled away pretty much the whole lot that was destined for a lovely pesto to go with the lamb. Along with a distinct nuttiness, mung beans have a grassiness to them that would really bring out the flavour of the meat. That was it, the food processor was out and the tasting began. Bits of this and bits of that were grabbed from the garden and what resulted was an incredible green sauce that not only made my Welsh lamb sing like Côr-y-Traeth but will be making tomorrow’s pasta dish swoon. Just throw everything into a food processor and blitz, loosen with the olive oil until you get a consistency you are happy with. Serve spooned over lamb or stir into pasta with a raw fresh egg yolk and top with grated Grana Padano cheese. Delicious! I think it’s a great idea – I adore mung beans. Great to see someone else using Welsh lamb too – it is the best in my mind. Do you soak your cobnuts/almonds/pistachios before using to get rid of their phytic acid? Hi there, no I just scoff nuts straight from the packet.